I booked this Monday off from work as I had a golf outing at Pitt Meadows Golf Course in the afternoon. 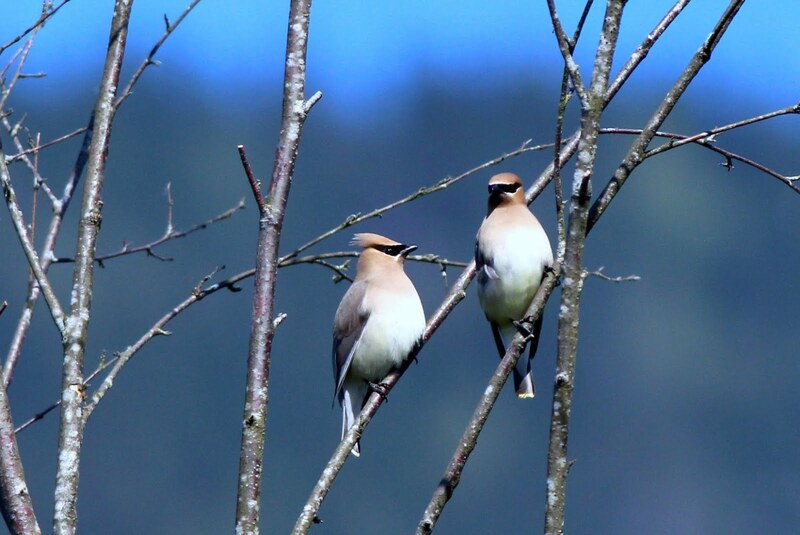 I arranged with my friend Mary-Jean to meet me at the golf course early in the morning so that we could go birding at Pitt Lake. She was commuting in from Chilliwack for work and took the morning off. We did the same thing last year and had a very good morning, hopefully this would be similar. 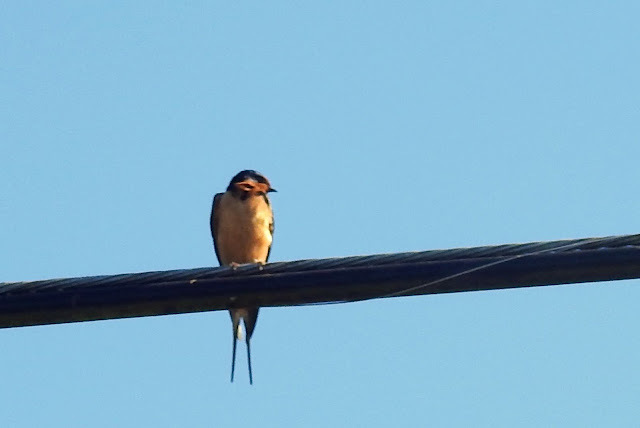 We took a quick side trip down a road where I'd seen an American Kestrel in January. There were no Kestrels, but I finally got a photo of a Barn Swallow. I'd seen one in January, but none since then. The next stop was Catbird Slough on the way to Pitt Lake. This area has a dike that looks down on the Alouette River as well as a few smaller ponds. 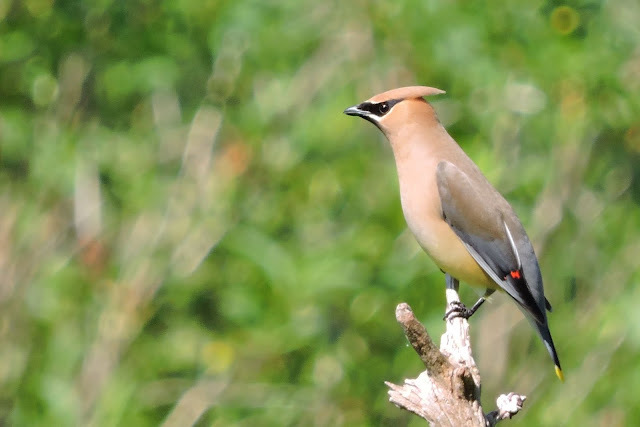 There is often a good collection of birds here, and they are tolerant of human activity. 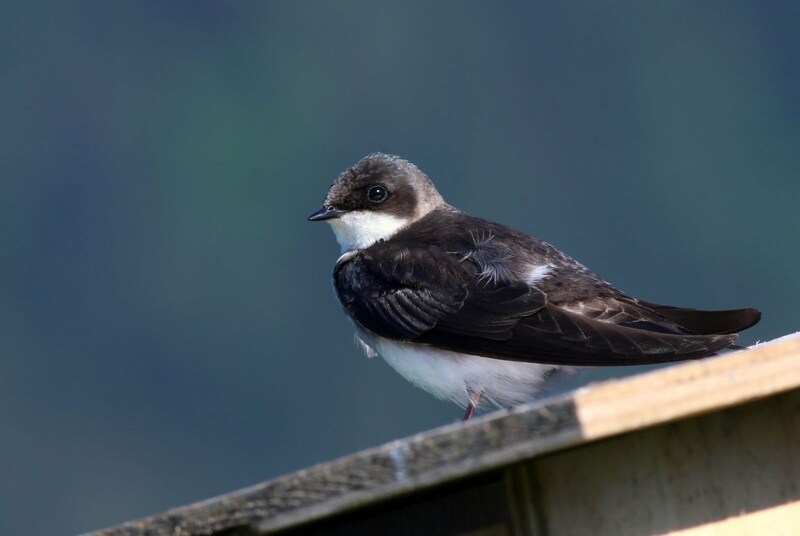 There are a number of Swallow boxes on the dike, this one had been put to good use. We briefly heard and saw a Willow Flycatcher with it's familiar fitz-bew call. We'd get better photos later in the day. Here's what I took at the time. 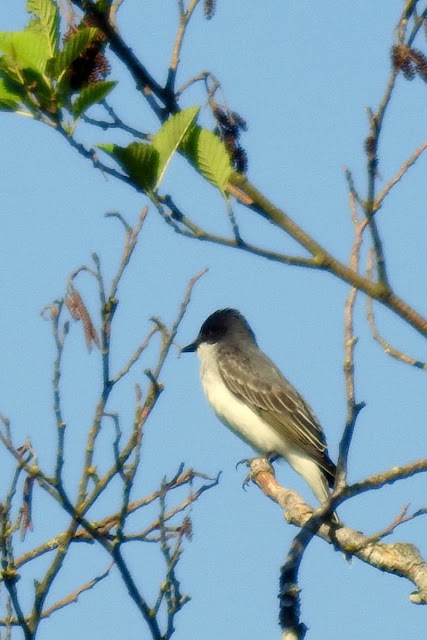 Then I spotted another flycatcher, an Eastern Kingbird. This was a lifer for Mary-Jean but she could not see it initially. I'd called out Kingbird, but she'd only ever seen a Western Kingbird. She was looking for a bird with Brown and Yellow colouring whereas the Easter is mostly Black, White and Brown. Fortunately, she did see it and added it to her life collection. 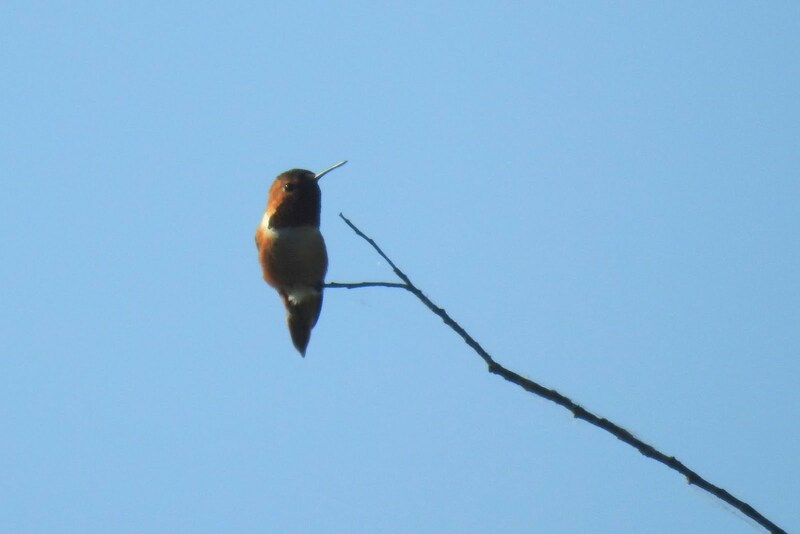 Next up was a Rufous Hummingbird perched on a tree. This male had probably completed his mating obligations and left the female to raise the young. Unknown to me, Mary-Jean had spotted and photographed a Yellow Warbler. I'd yet to see one this year and missed out on this one. I'd get one a few days later in the Okanagan. I believe she saw her lifer of this species a few days earlier in Chilliwack. 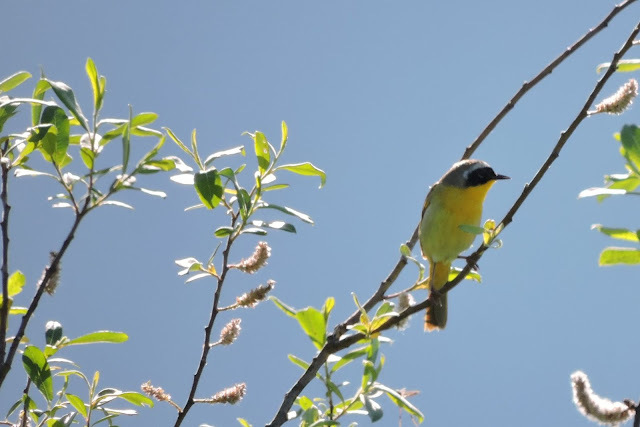 We then saw another Warbler, a Common Yellowthroat. Mary-Jean took the better photo, a common occurrence for the morning. 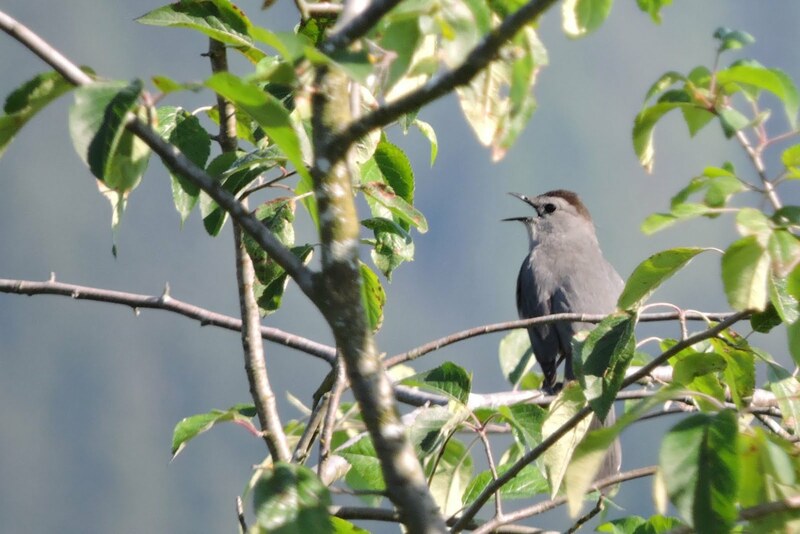 Catbird Slough has its name for a reason, it is one of the rare places in the lower Mainland where you can see a Gray Catbird. I heard one singing it's never-ending song and together we spotted it in a tree overlooking the river. This was another lifer for Mary-Jean, and once again she took the best picture. 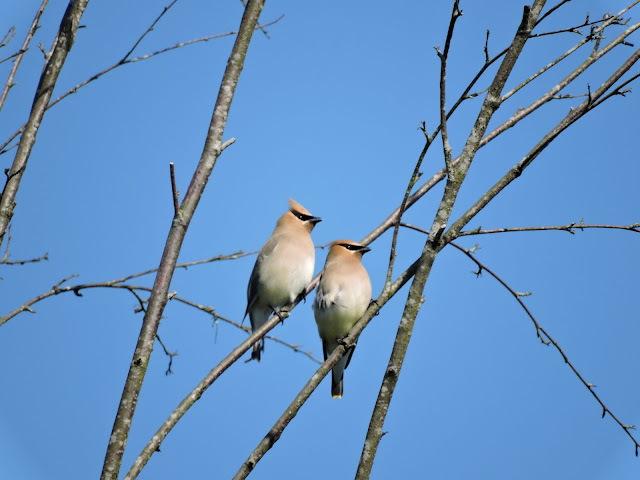 We weren't quite done with Catbird Slough yet, there were Cedar Waxwings in the area. The first photo is by me with the Canon, the second is Mary-Jean with her Nikon. We had exhausted Catbird Slough and moved on to the Nature Trail right at Pitt Lake. As we were walking in, with Mary-Jean in front, I saw a bird on the ground near the foot of the trail. At first i thought Sparrow, but then changed my mind and said Thrush. Mary-Jean was blocking my angle for a photo and she did not recognize the bird as a Thrush (she was thinking the brightly coloured Varied Thrush). I dodged around her and took one shot. 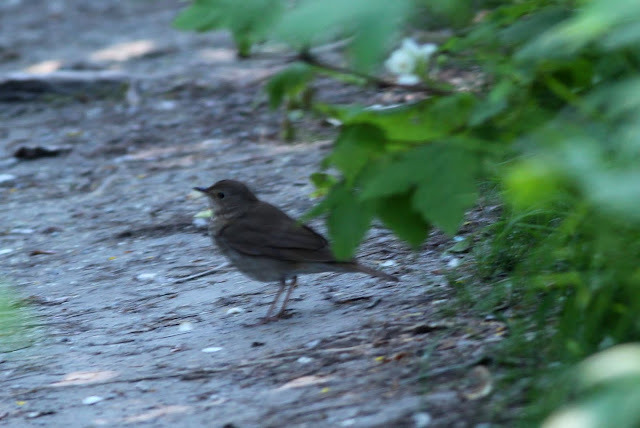 As I suspected, it was a Swainson's Thrush. This is my fourth photo ever of this common, but elusive species. 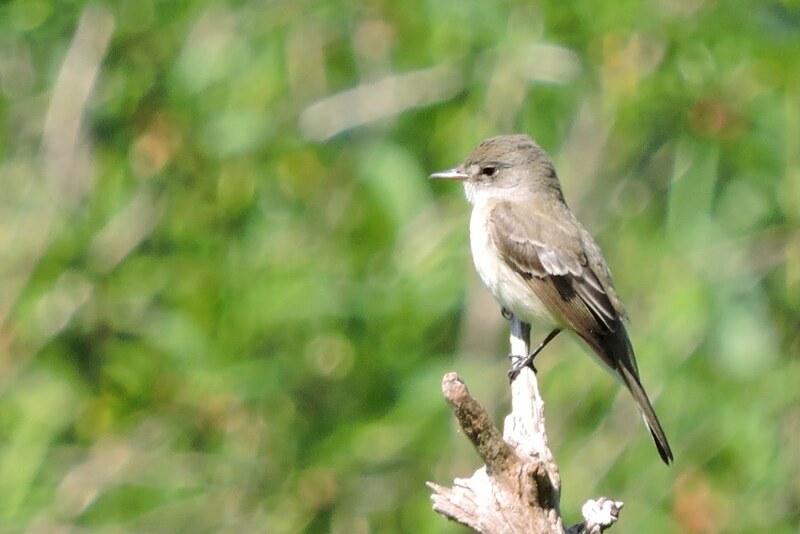 You can hear them in any forest in spring and summer, but they skulk around in the underbrush and are very hard to see. As we walked along the path we noticed a load background humming noise. 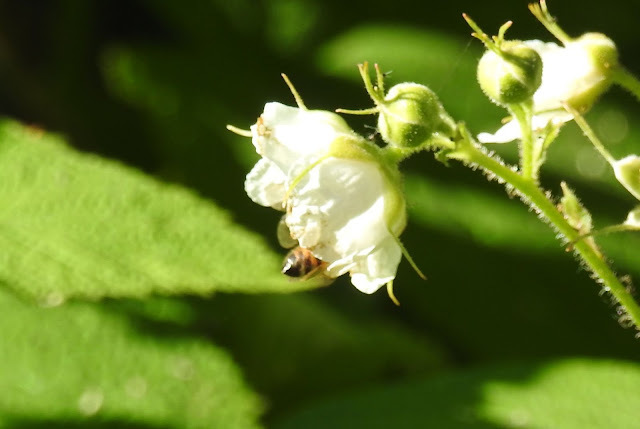 I believe this was from Honey Bees, they are used in the nearby Blueberry fields for pollination. We saw quite a few like this one along the trail. 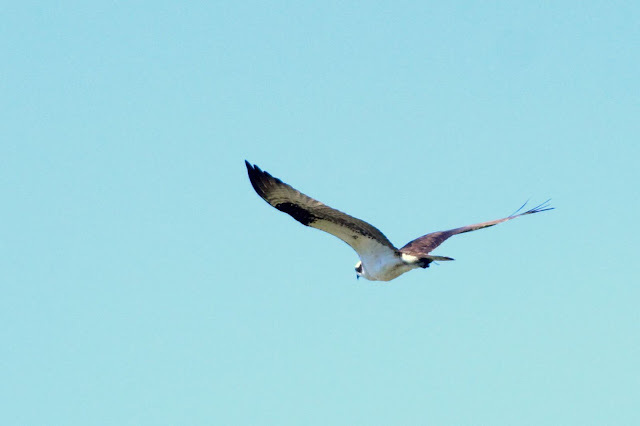 We had a brief flyover by an Osprey, a fairly common sight around Pitt Lake. It was quieter on this trail compared to Catbird Slough. 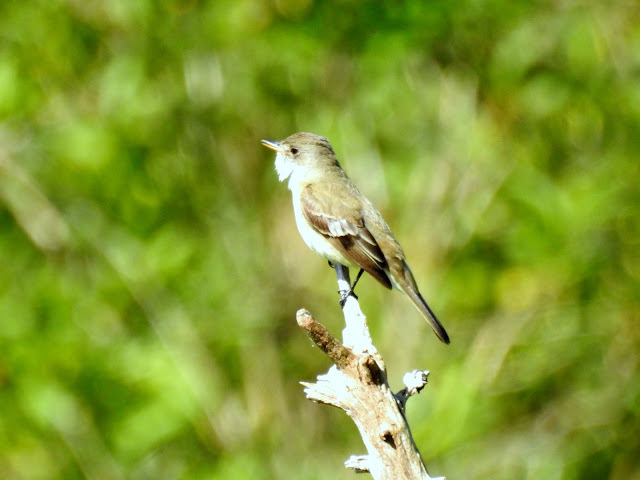 We did find one spot where a Willow Flycatcher was posing on a snag for us. Here's a photo from each of us, ladies first. Mary-Jean nailed this one of a Cedar Waxwing. 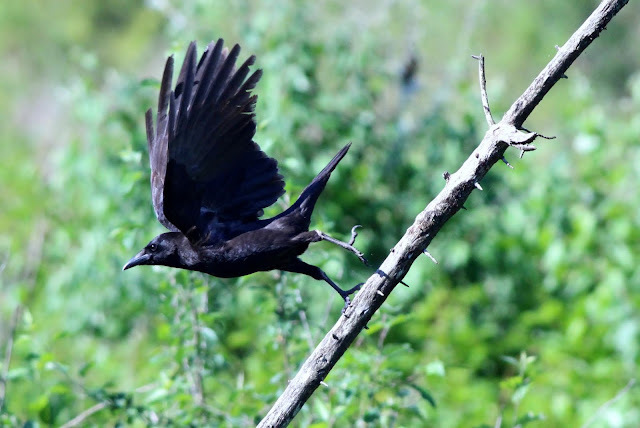 I caught a couple of shots of a Crow just as it took off from a perch. Here's the best of that series. 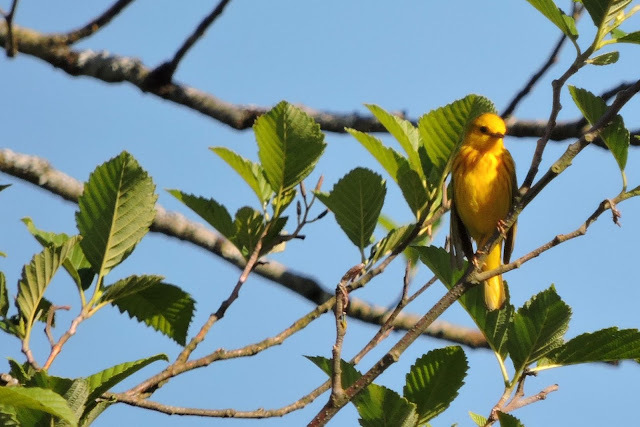 Finally, as we headed out we saw a Bullock's Oriole. 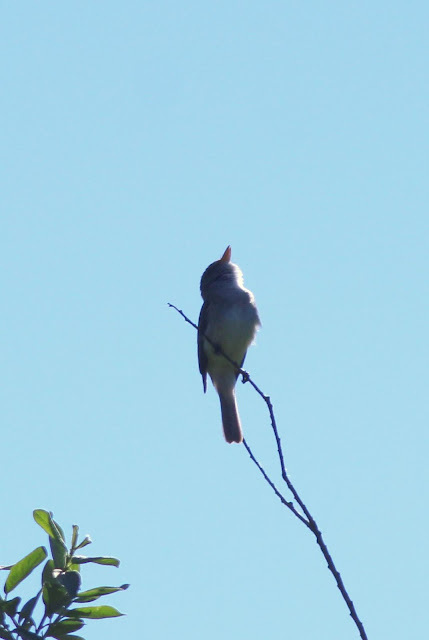 It was too brief to even raise cameras, but this was Bird # 155 for me. I'd have pictures a few days later in the Okanagan.